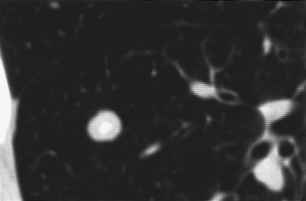 Figure 14 Postinfectious granuloma. 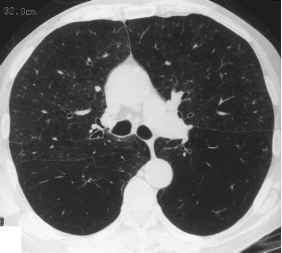 (A) Standard CT (7-mm collimation, lung window) shows nodule (arrow) with possible small, central punctate calcification. (B) Thin-section CT (1.5-mm collimation) better demonstrates the central punctate calcification in nodule and is diagnostic of a benign etiology. averaging can make calcification within a small nodule visually inapparent when thicker collimated slices (7 to 10 mm) are obtained. It has recently been shown that calcification can be inferred when a 3- to 7-mm nodule is visible on standard mediastinal images (level 25, window 350) obtained using 10mm collimation . Although this method can be used if it is not possible to repeat the study, in most cases reimaging with thinner collimated slices is preferable. Measurement of CT attenuation values (CT densitometry) can also be used to infer the presence of calcium within a nodule [14,20,25,26]. The use of this technique is, however, inappropriate if the nodule is spiculated or if the opacity is greater than 3 cm in diameter. A CT attenuation value of 200 Hounsfield units is usually used to distinguish between calcified and non-calcified nodules. If the density of the nodule is in the benign range (>200 HU), serial radiological observation is performed at 3,6,12,18, and 24 months to confirm absence of growth. The sensitivity and specificity of this technique for benign disease is not optimal, and the popularity of CT densitometry for discriminating benign from malignant nodules has declined since its inception in the early 1980s [27,28]. More recently, it has been proposed that measurement of CT attenuation values obtained at different kilovolt peaks may be useful in detecting visually inapparent amounts of calcium in a nodule [29,30]. Dual-energy CT compares the attenuation of a nodule imaged at 140 kVp to the attenuation of the nodule imaged at 80 kVp. This technique is based on increased photon absorption by calcium as the beam energy is decreased. Theoretically, this results in an increase in the CT attenuation number of a calcified nodule as the kVp decreases. A recent multi-institutional trial, however, has shown that dual-energy CT is unreliable for distinguishing benign from malignant nodules . Cavitation occurs in benign and malignant nodules. Malignant cavities typically have thick, irregular walls, while benign cavities have smooth, thin walls (Figs. 15, 16, and 17) [15,32,33]. For instance, 97% of cavitary nodules with a wall thickness greater than 16 mm are malignant and 93% with a wall thickness less than 4 mm are benign [32,33]. Although these measurements can be of some value in nodule evaluation, cavity wall thickness cannot be used to confidently differentiate benign and malignant nodules Fig. 17).